Being able to operate basic machining equipment should be an essential skill for every mechanical engineer. It’s really sad how often I hear 3rd and 4th year ME students say they have virtually no practical engineering skills. 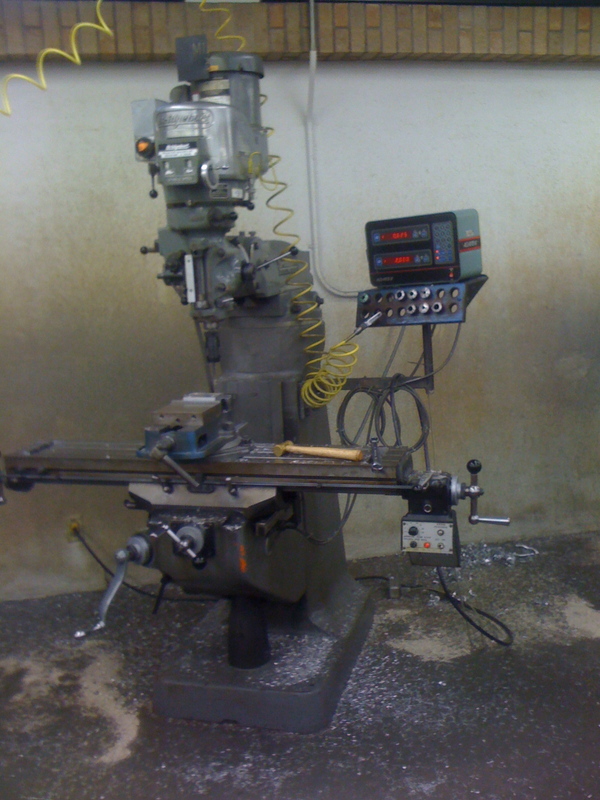 Granted most ME’s will never be required to operate a lathe or mill as part of their job, knowing the capabilities of the tools that will be producing your products helps you when designing those very same products. College teaches you a lot of equations and methodology, but you don’t really learn anything useful until you start designing and building stuff with your hands. So when I had the chance to take the machine shop course offered by my school I jumped at the opportunity. Fortunately for me I have access to equipment most home machinists can only dream about. This is a Bridgeport vertical mill with a DRO on the x and y-axis. The device hanging off the right end of the table is a power feed, which comes in handy when making long slow passes in the x direction. 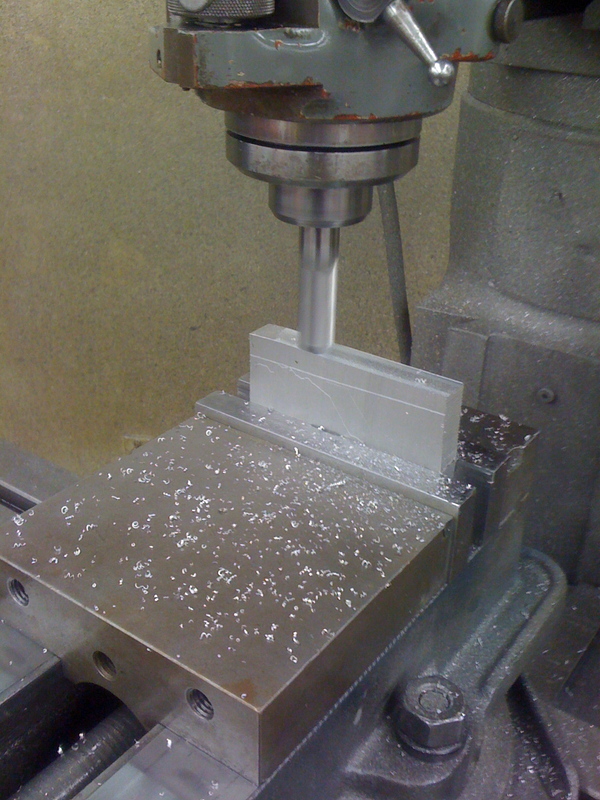 Most machining projects start with a blank of roughly square metal, aluminum in my case. One of the first operations is squaring the block on all 6 sides. 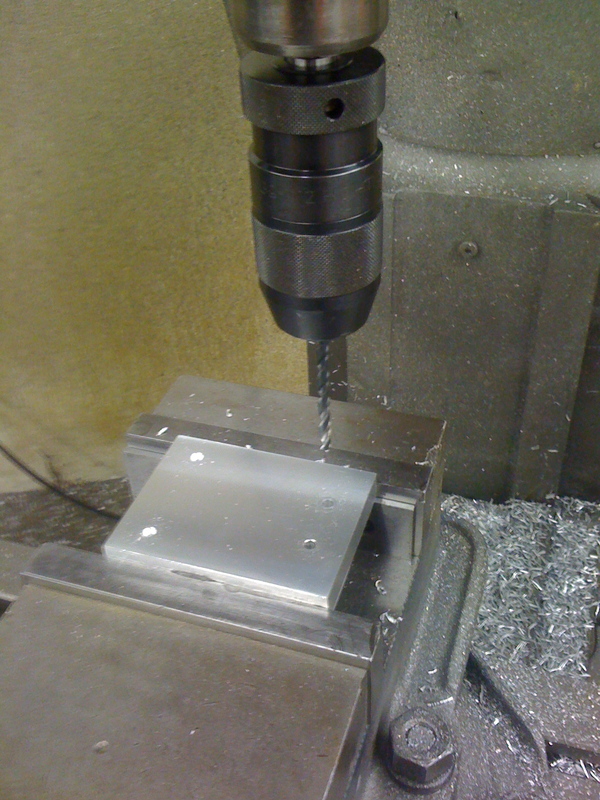 This squaring off procedure is usually accomplished with a set of end mills and a fly cutter.Here the side are being cleaned up from their rough extruded or saw cut finish. Once both side have been cleaned up you can take a measurement and get your part to a final dimension. The large flat sides are cut with a fly cutter. 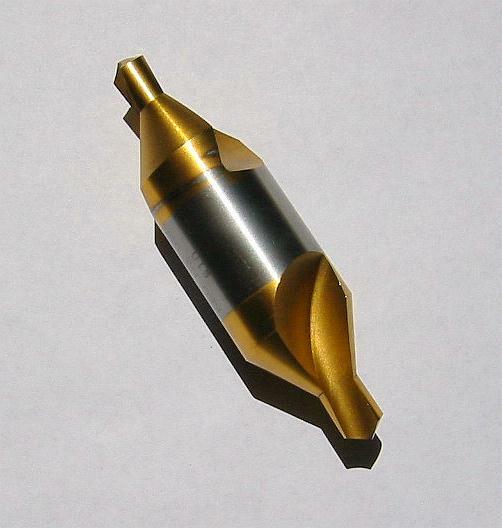 While you can make multiple passes with an end mill, the fly cutter is much faster and product a smoother finish. One of the limitations of a fly cutter is that you can’t remove much in a single pass, so if you have to reduce the thickness of a part substantially, more than say .100″, you are better of using an end mill and then follow it up with a fly cutter. Or, if you’re lazy, you can just find a different piece of stock that doesn’t require as much cleanup. 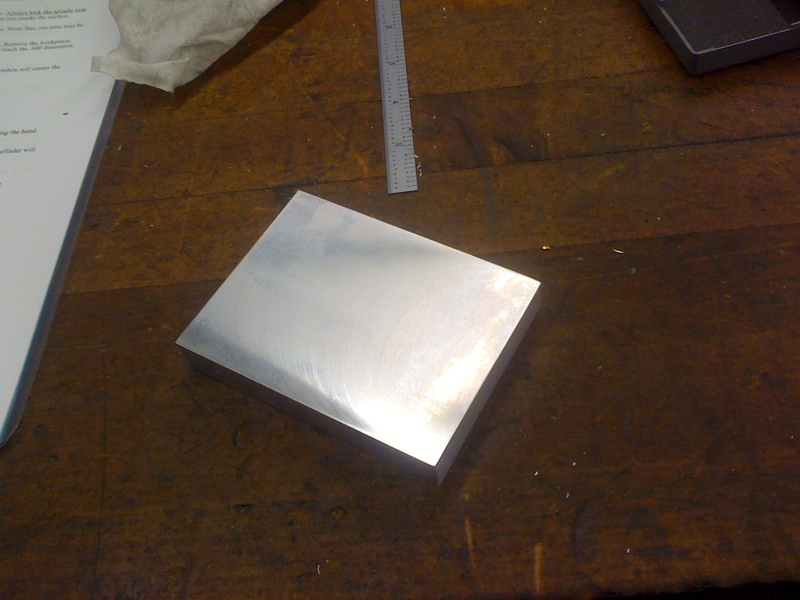 After all that you end of with a shiny square of metal, hopefully full of parallel sides and 90° corners. If not, go back to the top and start over again. The thing about machining is that all the tolerances add up, if your start with a less than square part all your features will be off as well. Now we get to start putting all manner of holes and slots, also called features, into our part. After edge finding and zeroing your x and y-axis you can start making holy parts. 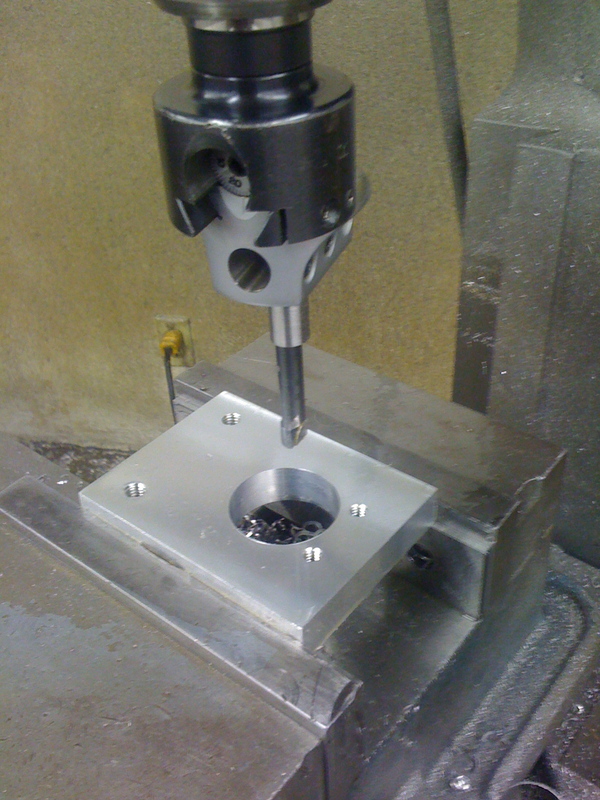 Drilling holes in precise locations is a lot trickier than it sounds. 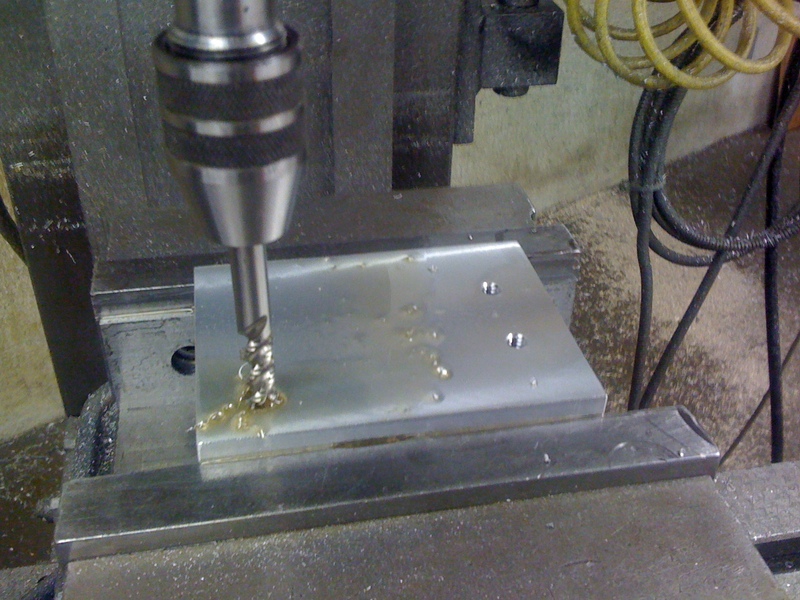 Prior to taking this class, when I drilled holes in metal I just pressed hard on the drill and watched the bit walk around the surface until it finally grabbed. What I should have been using was a center drill. Despite what you may think drill bits are fairly flexible, especially when putting large axial forces on them. A center drill is like a drill, but shorter, stubbyer, and has flutes that only extend a short ways up the bit. The result is a very stiff drill, that created a pilot hole for your actual bit. The spiral tap you see below is being use because the hole is blind tapped, meaning the hole does not go all the way through. 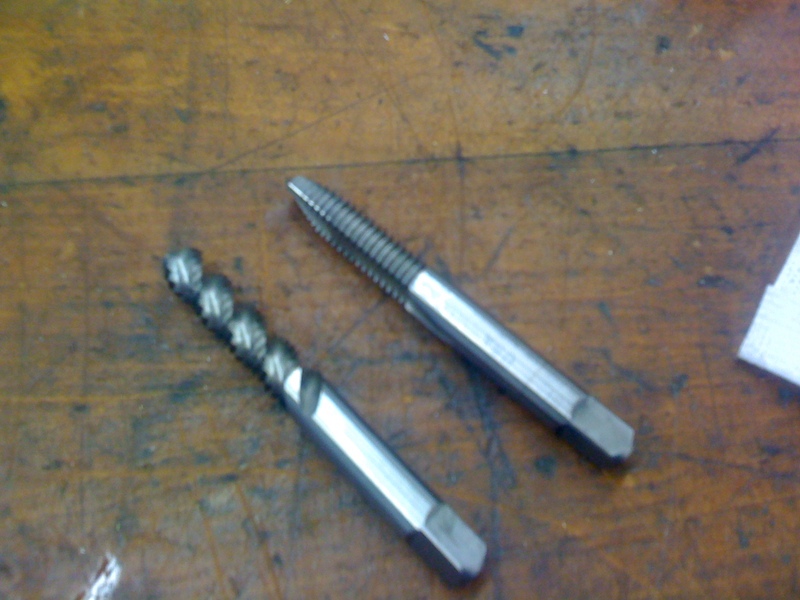 A spiral tap is used because the shaving created by cutting the threads are pulled out of the hole by the flutes. Using an ordinary tap for a blind hole would cause the shavings to ball up and collect in the bottom, most likely ruining your tapped hole. Spiral tap left, standard on the right, sucky iPhone macro picture all over. I have 30 end mills, single and double-ended. Shaft diameters ranging from 1/2″ to 3/4″. Mixture of 2-flute and 4-flutes. These were discarded from a machine shop that closed down, so they’re in good condition. I have a Sherline mill, so I can’t use shaft diameters this large. They’re yours if you want them. All I ask is to be reimbursed for shipping (they weigh in at about 9 lbs). While I was at grad school at UofM for architecture, I spent most of my time making things in their fantastic shops. In the wood shop they had a Bridgeport mill like the one you have. Somehow I was going to find a use for it and finally did; milling some cool plates for printmaking. I would laminate the 3/16″ thick aluminum plates onto an angled block, then mill 1.5″ slots from 0 to full depth of metal at 3″ centers. When you embossed these plates on printmaking paper, you got this interlocking effect. That year we “printed” circular saw blades, squares. Our printmaking professor loved them !